RETScreen Software Version 99 is designed to evaluate Renewable Energy Technology (RET) projects quickly and effectively. With this software, users are able to prepare a preliminary evaluation of the annual energy production, costs and financial viability of RET projects anywhere in the world. An online user manual and several databases are now provided with this version of the software to further facilitate its use. 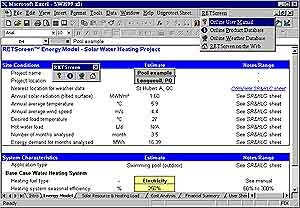 The Solar Water Heating (SWH) model can be used to evaluate three basic applications: domestic hot water, industrial process heat and swimming pools. The model is designed to analyze a wide range of application markets for process hot water from small residential to commercial/industrial scale systems, and from small residential to large community pools, both indoor and outdoor. Energy analysis is performed based on the system configurations and climatic conditions entered by the user. The Passive Solar Heating (PSH) model can be used to evaluate the difference in heating and cooling energy consumption between a proposed passive solar building (retrofit or new construction) and an identical building but without the passive solar features. The model is intended for low-rise residential applications, although it can be used for small commercial buildings, and it applies anywhere in the world where there is a significant heating load. The Ground-Source Heat Pump (GSHP) model can be used to evaluate both retrofit and new space conditioning applications, including residential, commercial and industrial buildings. Ground-coupled, groundwater and surface water heat pumps are all configurations that can be analyzed in the model. The online user manual is an integral part of the project analysis software. The online user manual is a help file built directly into the Microsoft Excel Workbook file and is designed to facilitate the use of the model as quickly and effectively as possible. The help file is organized in three main sections: Overview, Worksheets and Databases. The Overview includes important copyright and disclaimer messages as well as an abstract and background summary of the renewable energy technology. A description of each worksheet input and output item is included in the Worksheets section of the help file. The Databases section of the help file contains a description of the online product and weather databases. The online user manual contains a series of photos, tables and diagrams to further facilitate in the preparation of a project report. Canmet Energy Diversification Research Laboratory, 1615 Lionel-Boulet Blvd., PO Box 4800, Varennes, PQ J3X 1S6. Tel: 450-652-4621; Fax: 450-652-5177.